To ‘get one’s wires crossed’ literally means to be wrongly connected by telephone, but also has the idiomatic meaning “to become confused; misunderstand”. While originally referring to the physical crossing of telegraph wires on a switchboard, we continue to experience ‘crossed wires’ in digital communication to the point that it generates a new context for personal expression – one that emerges through a crossing of human and machine languages and aesthetics. In telephone calls, emails, text messages, video calls and social networking, ‘crossed wires’ appear as noise, static, time delays and pixilation. But the crossing of wires is also felt in more subtle and complex ways: it might occur when auto-correct changes what we say, when typos turn into personalised codes, or when slow Internet connections cause conversations to lag. 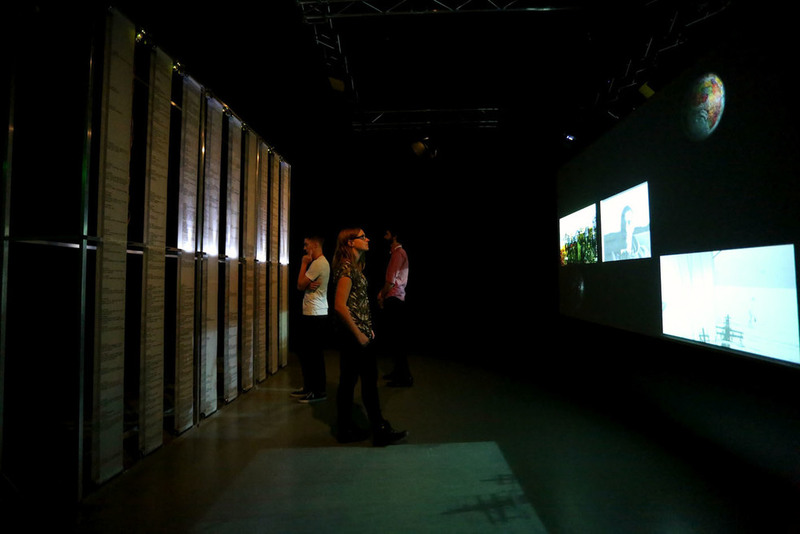 Crossed Wires is an interactive installation that explores the expressive potential of digital communication platforms. It brings together two equally limited modes of expression – stop-motion animation and SMS – in a combinatory system that redistributes and amplifies the effects of human-machine entanglements experienced in everyday communication. The installation illustrates personal expression in mobile communications as part of a broader, complex ‘expressive machine’. It embodies an experience opposite to what we expect from mobile phones. Instead of the seamless connection that is often marketed to us by the telecommunications industry, Crossed Wires integrates a sensibility of broken or disrupted technologies. It draws attention to how expression in contemporary communication is not simply – or even primarily – created by human authors, but is rather ingrained in and distributed throughout an information system. For the participant, Crossed Wires is experienced between two large screen structures. One screen is made of nine mechanical scrolls driven up and down by stepper motors. 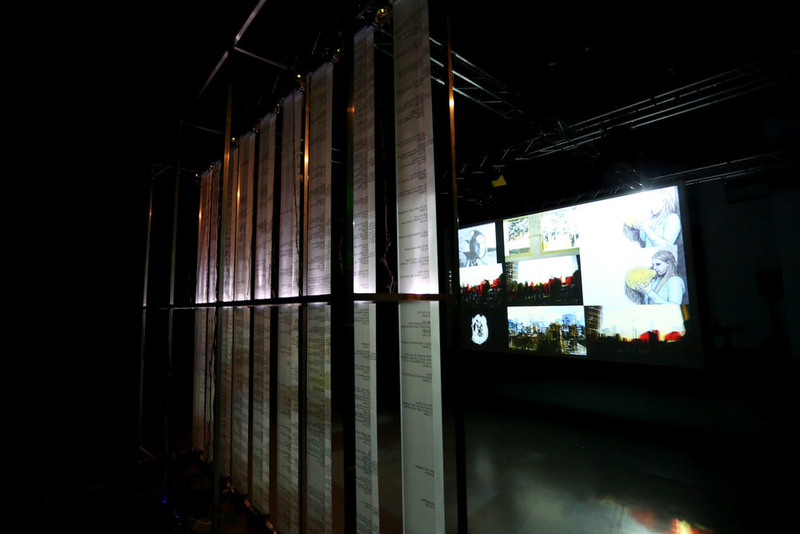 The other screen is a rear-projected video screen that electronically responds to participant’s movement in front of the scrolls, by playing animations in varying combinations according to a pre-designed combinatory code. The scrolls are printed with a selection of text messages taken from a collection of my own personal communications over a two-year period, however all names and signifying features have been removed, leaving the various narratives disjointed and ambiguous. With each scroll, there is an infrared sensor that detects a viewer’s presence. When a viewer approaches a scroll very closely, it stops moving and an LED light highlights the text message at its centre. This light signifies the scrolls engagement with the opposite screen, which responds by playing an animation, suggesting a kind of machine-to-machine ‘code’ being performed. 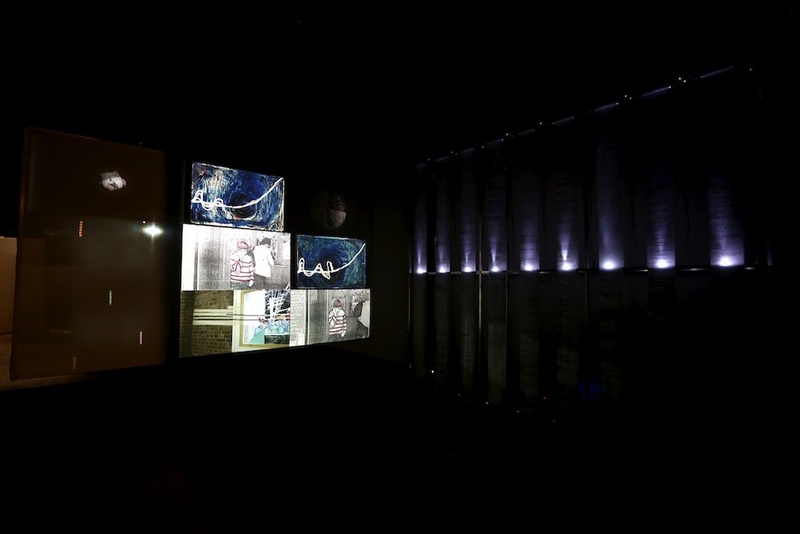 The result is a continually changing formation of texts and animations, activated by the movement of the viewer in the space between screen and scroll, message and animation. Tradewinds, 2013, animation, 3:40 min. Music by Yen Nguyen performed by Mechanical Pterodactyl. Tracks, 2014, animation, 1:55 min. In complete balance, 2012, animation, 3:30 min. Music by Paul Heslin.